How will we experience symphonic music in the future? 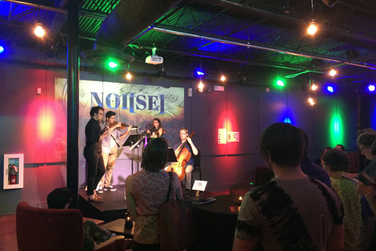 The National Orchestral Institute + Festival joins with the UMD Academy for Innovation and Entrepreneurship to produce the 2nd Annual NOI[SE] event, a place where musicians join with creative innovators to examine, rethink, and renovate the orchestral experience. Join us at MilkBoy ArtHouse to experience a series of provocations that imagine new ways for audiences to interact with orchestral musicians. This night of performances has been curated by The Innovation Studio at NOI+F, a team of musicians and designers who have been working alongside NOI+F. Enjoy craft beer, cocktails, and cheese curds while listening to music that will be performed on both levels of the venue by members of the National Orchestral Institute + Festival. The program will include live chamber music, polka, violin meditation, sight reading, and more. The National Orchestral Institute + Festival brings together aspiring orchestral musicians from across the country for a month of dynamic music-making and professional exploration. Chosen by a rigorous, cross-country audition process, these young artists present passionate and awe-inspiring performances of adventuresome repertoire at The Clarice and in the community. 16 hours 39 min ago.